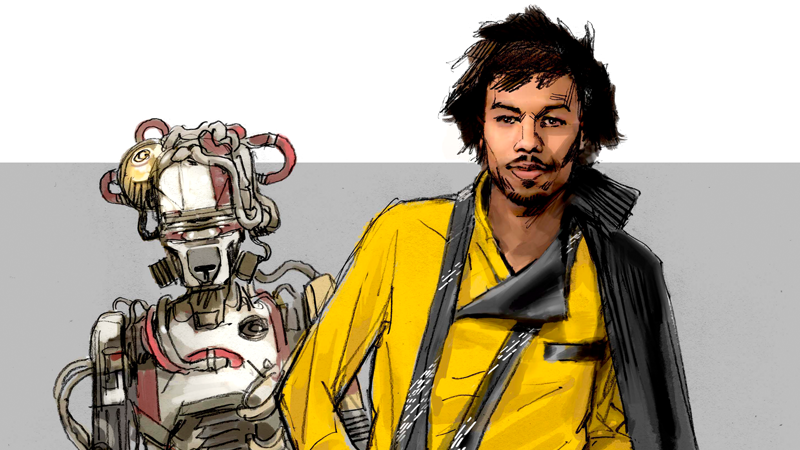 A variant of Lando’s final design as well as a very different L3-37 in concept art from The Art of Solo: A Star Wars Story. The latest Star Wars movie is upon us, which means so is a cavalcade of books about the process of bringing the world of a young Han Solo to life. To celebrate, we’ve got an exclusive look at the gorgeous concept art behind Solo, courtesy of Phil Stozak’s latest Star Wars art book. The Art of Solo: A Star Wars Story, published by Abrams Books, offers unprecedented insight into the Lucasfilm art department’s concept work over the course of Solo’s production—providing insight from artists, designers, and other members of the crew about how the movie came to be, as well as a veritable treasure trove of never-before-seen concept art that shows how the characters and worlds of the movie came to be as they are on the big screen. The cover art for The Art of Solo: A Star Wars Story. io9 is proud to debut just a few samples of some of the art you’ll find in the book below—and don’t worry if you’ve not seen the movie yet. There’s nothing too spoiler-y! The Southern Alps extended into other countries, but the Dolomites are in Northern Italy, our area centered around Cortina. The Austro-Hungarians and the Italians fought over the area during World War I. You go there, and could very well be in Austria. They’ve got all of these incredible, highly decorated gingerbread chalets, German gothic writing, even on the signposts. It’s bizarre. And they speak this incredible hybrid German/Austrian/Italian. The Art of Solo: A Star Wars Story is available now.